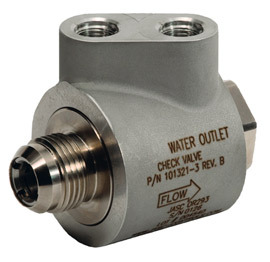 Technology advancements such as water-cooled liquid fuel check valves, corrosion-resistant flow dividers, and reliable flow-proportioning check valves that offer precise crack pressure solve these issues and more, dramatically increasing reliability and reducing expense and potential downtime. Over the years, many users purchased gas turbines with dual-fuel capability to maximize availability, or so they thought. Most of those machines were designed to operate either on natural gas or distillate oil, thereby providing owner/operators some measure of protection against fuel supply disruptions and price volatility. However, users often found operation of dual fuel systems problematic and many either decommissioned or removed their liquid fuel systems altogether. (smcelr8176@aol.com), a specialist in gas turbine auxiliaries with more than a quarter century of experience troubleshooting fuel-system problems on frame engines for a major OEM. He now heads his own company, SMTC Inc, Greenville, SC. More importantly, McElrath says, trips under load when attempting to transfer from gas to distillate shorten the life expectancy of expensive combustion hardware. For example, each trip can cause the equivalent wear and tear of eight to ten fired starts. When researching the root cause of the liquid fuel systems’ dismal track record, he continues, you’ll find check valve and flow divider failures are responsible for up to 85% of the documented system problems. In addition, the emissions regulations governing the operation of most power plants may create yet another barrier to the extensive use of oil. McElrath says he knows of several facilities that are only allowed to operate on liquid fuel a maximum of 25 hours annually. But the potential for volatility in natural-gas supply should a natural disaster or terrorist attack adversely impact fuel-supply infrastructure may not allow at least some users to ignore the performance of their liquid fuel systems. Given the complexity of the issues facing owner/operators of frame machines with respect to fuel systems, McElrath continues, “the solutions are amazingly simple.” The primary cause of liquid-fuel-system failures is check valves that stick open, stay closed, or remain somewhere in between after the gas turbine engine runs for long periods on natural gas. What happens, he adds, is that high temperatures at the combustion cans “cook” the fuel inside the valves thereby promoting the buildup of a hard residue which inhibits valve operation. “While fuel system pressure is more than adequate to force a coked valve open,” McElrath says, “the return spring generally is not strong enough to close it completely. Once two or more check valves or three-way purge valves coke sufficiently to create a seal failure, cross-talk between combustion cans will evacuate the liquid fuel system. Obviously, this compounds the coking problem. The best way to prevent this problem is to keep the temperature inside the check valve below the coking threshold of 250F. Tempe-based Jansen’s Aircraft Systems Controls, Inc. (JASC), which specializes in the design, development, and manufacture of fluid-system flow-control products, has achieved this goal with a liquid-fuel check valve that resides within an external water jacket (Figs A & B ). McElrath offers this update of the first facility to install the JASC liquid-fuel check valves: Valero Energy Corp’s (Delaware City, Del) refinery, home to a 60-MW cogeneration facility equipped with two GE Energy Frame 6FA gas turbines, completed only two of 50 fuel transfers successfully from commissioning in 1998 through August 2004. Following the installation of water-cooled check valves during August 2004 on one unit and during April 2005 on the other, the plant’s success rate has been at 100% for transfers from gas to oil and vice versa, even after having run for as long as 22 consecutive days on gas. This level of performance has been duplicated on other frame models where actively cooled fuel controls have been retrofitted, says McElrath. The water-cooled check valve system can be installed in about 2 hours, requires no control modifications, and typically only requires service during hot-gas-path inspections. Historically, flow dividers have been prone to failures caused by corrosion that occurs when water settles out of the distillate during long periods of liquid-fuel system inactivity. Contaminants in the oil also have been linked to many failures. Roper Pump Co based in Commerce, Ga, developed its Duraflow flow divider to resist corrosion and to tolerate contaminants. Traditional cast iron has been completely eliminated in the Duraflow, replaced by higher-grade materials (Fig C). To illustrate: Flow-element faceplates, now made from stainless steel, have replaceable bronze wear plates on both sides of the pumping gears. Gear cases are also made from a special bronze. These materials are virtually unaffected by water in the fuel, so corrosion should no longer be a problem. The stainless also resists wear, contributing to extended service life. Bronze contributes to higher reliability by making the flow divider less susceptible to failure should it ingest small, fuel-borne solid contaminants. The relatively low surface hardness of bronze permits any hard particulate matter present in the fuel to embed itself into the metal, or to plough through a running flow element, without causing the flow divider to seize. Bronze also is an excellent bearing material, making it an ideal choice for the wear plates which will support stainless steel flow-element gears running against them without galling. Gas Turbine owner/operators can, when sending their flow dividers in for refurbishment or repair, opt to have them upgraded to the Duraflow design by Roper Pumps. Depending on equipment condition, significant savings may be realized by selecting this option. Note that this option for some rotary flow divider owners means replacing the rotary design with a linear type. Learn more about Roper Pumps’ Flow Dividers at www.roperpumps.com. 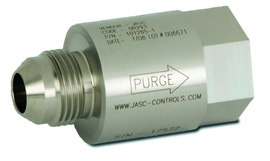 Another step towards trouble-free gas turbine operations, according to McElrath, is to install JASC’s reliable water-proportioning check valves in the water injection system used for NOx control (Fig D). Excessive water flow faults when the water injection system is activated. Users typically replace several of these valves annually both during outages and when they fail in service. 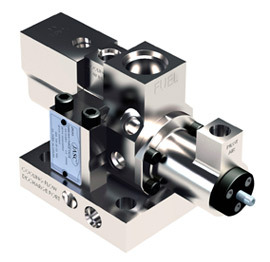 Stable flow over the entire operating range of flow and pressure. This is accomplished by using an inverted spool (this is the same concept as JASC’s liquid-fuel check valves) that shears across the metered flow stream, essentially making the moving element insensitive to flow forces. Bubble-tight sealing in the reverse flow direction. A special plastic permits reliable operation at temperatures from less than –100ºF to 700ºF. Excursions to 800ºF can be accommodated for up to five minutes. Maximized resistance to particle contamination. The valve is designed to maximize the clearance between the sliding poppet and the stationary guide. It also incorporates a means to prevent metal-to-metal contact between the poppet and guide so that galling will not occur with the use of water. The flow path is designed with a smooth contour, minimizing parasitic pressure losses and minimizes pockets in the flow path where contamination can build. The spring is designed for easy adjustment to provide a precise crack pressure. The spring and its adjusting mechanism are also isolated from the main flow path to eliminate spring resonance interaction with the flowing media. The valve assembly is a self-contained cartridge design that is inserted and mechanically retained within a main housing. The main housing contains the inlet and outlet fluid connections and can be of single or two-piece construction. The valve assembly is able to withstand a thermal shock without degradation in performance with the unit heat-soaked to 400ºF when suddenly and fully immersed in water. Gas turbine owner/operators can return their failed flow proportioning check valves to JASC for refurbishment with internal components of its design or purchase new valves, which include new housings. 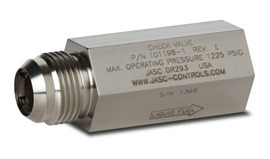 A JASC upgrade requires that a complete set of its valves be installed. Allowing two or three of the old valves to remain in the system will cause the current symptoms to continue. In summary, innovative designs are ushering in a new era in liquid-fuel system flow control. Perhaps the most important contribution of these new products is a dramatic increase in the reliability of liquid fuel systems to more than 90%, while allowing owners to run on distillate as little as once every three or four months without compromising reliability. Another benefit of these new valves and flow dividers is that their maintenance schedules will coincide with hot-gas-path inspections and decrease the cost of annual maintenance for gas turbine users.